The Atlantic Canada Solar Directory is made up of organizations, mostly businesses, which supply solar and alternative energy goods and services, and who are "Corporate" members of Solar Nova Scotia, paying annual dues and agreeing to follow the Solar Nova Scotia Code of Ethics. To filter the results, you may choose a product or service from the select box and click Apply. 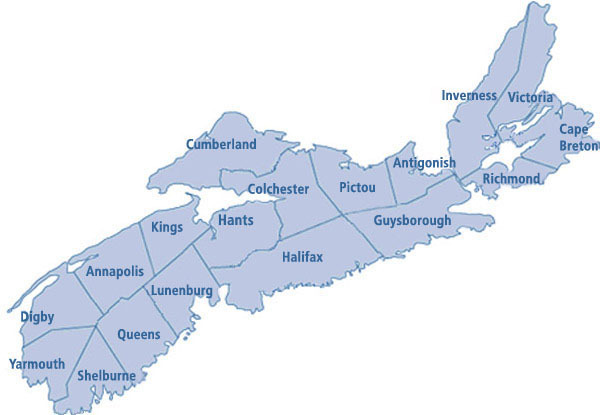 Here's a map of Nova Scotia counties. … is a team of highly skilled professionals in the electrical and solar marketplace, specializing in grid tied and off grid photovoltaic systems. We offer design to completion for your solar project, let us help you. Appleseed Energy is a full service green energy provider for North Eastern Nova Scotia focusing mostly in Cape Breton Island, Antigonish County and Guysborough County. We specialize in residential, agriculture, business, municipal and marine energy systems and products. We build, install, and maintain grid-tie (Net Metering) as well as off-grid (stand alone) systems. Since 1999, Benoit Electric has been dedicated to providing the best electrical services to our customers across Nova Scotia. With our team of skillfully trained technicians, our main focus is on serving our customer’s needs. We will design, supply and install the best photovoltaic system to meet your needs and gain the highest return on investment. While specializing in off grid and grid tied net metering photovoltaic systems, we also offer a full line of electrical services including Cummins and Generac home stand by generators installations and servicing. Bentley Built Homes is a small owner operated business in the Annapolis Valley with a strong focus on quality high efficiency housing. We do new construction as well as renovations and restorations from design to completion. We are an ICF builder and incorporate geothermal, and air-source heat pumps as well as solar supplements for domestic hot water and photovoltaic systems whenever possible. ... with 42 years experience designing and building passive solar homes, attached greenhouses, and workshops with air recirculated heat storage slabs. Over a hundred and forty projects. Co-author of The Canadian Solar Home Design Manual and Canada's 1990 Solar Energy Society Solar Person Of The Year. East Coast Solar is a renewable energy company based out of the Halifax area. We specialize in the design, installation and servicing of photovoltaic (PV) solar systems. We familiarize our customers with current trends and products in the market. This allows them to take part in every step of the process from system design to installation. Energyhub.org is a free online resource created to help Canadian home and property owners utilize natural resources to produce energy, as well as to help them use and manage their energy sustainably. Our ultimate vision to to create a Global Sustainable Energy Market – that is a globally connected free market for energy which does not interfere with nature’s inherent ability to sustain life. At Fundy Solar, we design and instal grid tied and off grid solar power systems. We carry a full slate of renewable energy products and have the experience to provide solid advice and service to our customers. Serving Halifax County, East Hants, Colchester County and surrounding areas. When you have industrial, commercial, residential or agricultural work that needs to be done quickly and with an eye for quality, look no further than Geddes And Murphy Electric. We have the most highly-trained, industry-certified electricians with years of experience. Green Lizard provides photovoltaic (PV) solutions for Off-grid or Grid-tie applications, each custom designed to meet individual customers requirements. PV is the safest, least maintenance intense method of producing clean power for today's power needs. Green Power Labs is a predictive energy management company with offices in Canada, California, Australia and China. Green Power Labs provides predictive analytics services for solar asset management including long-term (planning), mid-term (deployment) and short-term (operations) horizons, increasing power output and reducing operational costs of solar power plants. Based on its SolarSatDataTM predictive analytics platform and supervisory control technologies for smart inverters, Green Power Labs provides predictive grid control solutions maximizing power output of solar power plants while supporting operating conditions in the grid. While we are not vendors or installers of residential solar equipment, our team's interest in encouraging solar deployment led to the development of SolarRating Online, a free, online, short program which takes homeowners to their rooftop to gain an initial understanding of their site's potential for solar technologies. Visit www.solarrating.ca for more information. McInnes Cooper is among the 20 largest business law firms in Canada. We serve clients across North America and abroad from six offices in Halifax, St. John’s, Fredericton, Moncton, Saint John, Charlottetown. With 200 lawyers and over 300 professional resources, we are positioned to offer clients a range of legal and business services. We provide services to industry-leading clients in every major sector and with experience in all jurisdictions. We also assist small, medium, and start-up businesses at every stage of development with corporate and tax planning, commercial transactions, litigation services, and regulation review and analysis. National Solar Distributors Inc. is a wholesale distributor of solar PV system components based in Edmonton, AB with service across Canada. We carry residential and commercial grid-tie products, as well as products for industrial and small off-grid applications. With over forty years of combined experience, we understand the challenges of the market and have made it our mission to provide high-quality, reliable and innovative products with honest and friendly service. We are focused on delivering the right products to you – on time and at a great price. If your business succeeds, so does ours. Call us today to speak with one of our friendly associates. TNG is proud to offer residential and commercial installation of solar hot water systems, solar hot air panels and Energy Star air-source heat pumps. We also offer enzymatic Pink Cleaning Solution, custom-fabricated metal recycle bins, and eco-friendly marine products. Our company is dedicated to trust and integrity in our business practices, and we are committed to the sustainable development of our business and our community. Since 1996 we have been providing customers with a variety of options when they are pursuing alternative energy product. Servicing Nova Scotia, New Brunswick, Newfoundland and PEI from our Pictou office. Customers can call or email for information on solar, wind or water systems. We offer design, sales & installations for small, medium & large systems including Solar Power (PV or photovoltaic), Solar Hot Water, Solar Hot Air, Wind Turbines and Micro-Hydro systems. Free quotes and site assessments available. Specializing in off-grid and grid-tied solar energy, SAGE Energy provides sales, installation and service for renewable, sustainable and electrical energy systems throughout Nova Scotia, New Brunswick, Newfoundland and PEI. We are industry leaders, and our company is proud to be COR safety certified through NSCSA since 2012. We can help you with your DIY or turnkey projects. As Nova Scotia’s only Solar PV Projects Development Company, we strive to bring solar solutions to more homeowners and increase the positive impact we’re having on the environment. Our focus is to deliver customers an extraordinary experience; and our people are hired and trained to make sure our customers are our best form of advertising. Our vision is to make solar power accessible to every Nova Scotian; a lofty goal but one we feel is worth aiming for. We are constantly growing and adapting, and looking for ways to take our service a step further. We are Ambitious – Bringing solar to all Nova Scotians is no small feat, but one we believe is possible. We are Champions - We are the number one supporter of solar and champion it every day. We are Leaders - We are Nova Scotia’s premier solar PV provider. Solar Ascent specializes in designing and installing solar energy systems for home-owners and businesses in Nova Scotia. Not only are we trained at the world's foremost institution for solar energy education, Solar Energy International, and are NABCEP certified, we also have a rich background in renovations contracting throughout HRM. We know the importance of quality workmanship and attention to detail. Based in Halifax, Solar Ascent promises to work with you to design a system that is customized to your home and your needs. Renewable energy is an exciting new world that can be intimidating at times, but at Solar Ascent, we're making solar simple! Contact us for a free solar proposal for your home today! Among many other activities, Solar Nova Scotia provides education at minimal cost on all solar, and many other renewable energy topics. To be notified of upcoming courses and events, join our mailing list! Solar Panel Power Canada provides information about the solar energy industry to residential and rural homeowners in Nova Scotia. Our goal is to accelerate the solar energy industry by providing transparent, easy to navigate information to inform purchasing decisions. We began in late 2017 by researching and collecting data for every aspect that impacts the decision to switch to solar power in Nova Scotia including financing options, net metering policies, electricity rates, solar irradiation, installation costs and more. The summation of this information can be found on the Complete Solar Power Guide for Nova Scotia 2018. Stanton Solar is proudly based in Halifax and serves all of Nova Scotia. Specializing in solar power projects for both residential and commercial. Using only leading edge technology to give the best power production with the lowest maintenance costs. We offer PV, PV Hot Water, SolarShingles and heat pumps. Our installation crew takes your roof and your entire home very seriously. They take a lot of pride in their work and produce a solid finished product that will stand the test of time. We were here before the rebate and we'll be here after the rebate. TDL is a Nova Scotian owned and operated company based in Dartmouth, NS since 1981. TDL manufactures a range of products including complete solar collectors (glazed, LFP type), solar thermal water heating systems, photovoltaic (PV) water heating systems, heat exchangers, and solar powered pumps. TDL also designs, supplies, and installs grid tied and off grid PV systems. TDL manufactures, supplies, installs, and maintains all of its products and systems from small-scale single family residential to large-scale commercial/industrial projects. Unconquered Sun Solar Technologies Inc, was established in 2008 and is a manufacturer of practical and innovative PV tech. USST has engineered and constructed hundreds of residential, commercial (FIT) contracted & net metered solar sites across Canada. USST sites have exported almost 17 GWhrs of clean renewable electricity to the grid, and USST FIT solar installations are on pace to pay over 70M CAD to USST clientele. Located in Cape Breton, W. McNeil Electrical Contracting Ltd. offers clients, a tremendous value, while drawing upon years of industry experience to deliver quality work. With certified solar installers and Red Seal Master-endorsed electricians, we can complete all your requests. Safety is always our primary focus, and our commitment to excellence is second to none. We are a full-service electrical company specializing in green energy initiatives. We offer a wide variety of specialized services for residential, commercial and agricultural clients. We build, install, and maintain both grid-tied (Net Metering) as well as off-grid (Stand Alone) systems. W. McNeil Electrical Contracting has the skills to complete your next project on time and on budget! WattsupSolar is Nova Scotia’s leading supplier of residential and commercial photovoltaic (PV) solar solutions. We don’t install heat pumps and we don’t sell solar thermal systems. Our team specializes strictly in the design and implementation of PV systems that maximize production and shorten the return on your investment. This means sourcing only cutting edge solar technologies that boast the best performance specs and the most durable warranties. We have helped hundreds of families in Nova Scotia reap the rewards of a solar system on their home or business by either eliminating or significantly reducing their power bills. Let us help you do the same.